Your ankle joint is made up of four bones. The two bones of your lower leg, called the tibia and fibula, fit over your talus bone. Your talus bone sits on top of your heel bone, or calcaneus. The most common place for the ankle to break, or fracture, is at the ends of your tibia and fibula. These are also called the medial malleolus and lateral malleolus. This often happens because you have rolled your ankle while playing sport, particularly if there is another force, such as a rugby tackle. 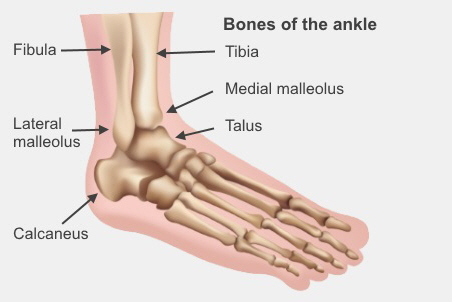 Breaks in the talus and calcaneus tend to be caused by a blow to the base of the foot, for example in a car accident, or a fall from a height on to a hard surface. Your doctor will diagnose this injury by listening to your explanation of what happened, examining your ankle, and looking at an X-ray of your ankle. You might need another scan, such as a CT or MRI scan, if the X-rays are not clear. There are different ways to treat a broken ankle, depending on where the bones are broken and what sort of break it is. If the break is in a good position, you may be put into a plaster of Paris cast to support your ankle and stop the bones from moving while they heal. If the bones are not in a good position or if they are unstable, you may need an operation to put them in the right position and fix them in place. The surgeon may need to use a metal rod or a plate and screws to hold your bones in place. If the break is more complicated, you might need a metal frame around the outside of your ankle to keep the bones in the right position. Your orthopaedic surgeon will talk to you before any surgery about your options and what they plan to do. You will be given antibiotics during your operation. If your ankle is very swollen, you may need to wait for a few days before surgery, because the tight skin can make it difficult for wounds to heal. During this time, you will be put into a plaster of Paris backslab, which is a half cast around the back of your leg, to make you more comfortable. You will be asked to keep your leg up on pillows. Before and after surgery you may have a plaster of Paris cast or backslab fitted to support your ankle and stop the bones from moving. Your leg will be up on a pillow to help reduce any swelling. You may feel some numbness or tingling in your leg or foot, but this will eventually get better. Your nurse will regularly check the blood flow to your injured leg. They will also check how much pain you are feeling and give you pain relief, which your doctor will prescribe. You may need to continue taking antibiotics. You will also see a physiotherapist, who will aim to get you moving as soon as possible. This helps to prevent problems that can happen with long periods of bed rest. These can include deep vein thrombosis, infections, and muscle weakness. Your doctor will let you know how much weight you can put on your leg. The physiotherapist will teach you how to walk with either a walking frame or crutches without putting too much weight on your leg. Before you leave hospital a physiotherapist and occupational therapist will assess what help you may need at home and arrange it for you. You can also talk to a social worker about any worries you may have about going home. When you leave the ward, you will be given a follow-up appointment, a discharge letter that explains what has happened to you and your treatment plan, and a prescription or medication card if you need one. If you have any concerns after you go home, please see your GP. Written by director of nursing, Orthopaedic Services, Canterbury DHB. Adapted by HealthInfo clinical advisers. Page created April 2016. Last updated November 2018.